Looking for a little slice of Scottish paradise? Eco award winning Comrie Croft offers something for everyone, cosy rooms in our hostel, wild camping in the woods, glamping in Nordic Katas, relaxed family friendly meadow camping (all with fires) and some people even get married here. The onsite camping facilities include piping hot showers and clean, fresh toilets. The small but perfectly formed shop has everything you could need, beans & local sausages, eggs laid by our own hens, camping accessories & wee treats for the kids. Don’t want to cook? The Tea Garden café (open seasonally) can look after you, bacon rolls in the morning, soup & sandwiches for lunch and lots of yummy cakes! For kids there are rope swings just begging to be swung on, woods perfect for hide and seek, a pond to paddle in and secret fairy and elf houses to search for. We have two cottages surrounded by farmland, beautiful scenery and wildlife. The semi-detached, single-storey holiday cottages sleeping two guests in each property are accessed by a rough tracks and set in the heart of the scenic West Strathearn area of Perthshire and only three miles from Comrie. Glen Cottage is a large family holiday home sleeping up to 8, with WiFi, central heating, a private garden and games room with table tennis. Private parking for two cars is available directly outside the property with access through a gate. There is level access into the property and one double en-suite room downstairs. Upstairs there is a second double en-suite room and two twin rooms. Park Lodge located 1.5 Miles outside of Comrie Itself set in its own private grounds with a large established garden and ample parking. The house is furnished throughout to cater to most needs. 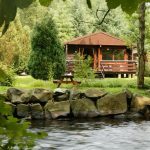 Our Log Cabins are very comfortable, set in peaceful surroundings on the wooded bank of the River Earn, 1 mile from Loch Earn. Our self-catering log cabins, made from the finest Finnish logs, sleep six. They are doubled glazed, and tastefully furnished throughout, and contain everything needed by six people to have a relaxed holiday. Tighnablair Cottage sleeps six, three bedrooms, large fully fitted kitchen/ diner, TV room and porch. All linen and towels supplied. Fully refurbished and very comfortable. Cottage is situated at the foot of Ben Clach with fenced secure garden. Very peaceful with wonderful views of the Ochils and Highland Perthshire hills. Wild swimming and fishing in River Knaik and walking in the surrounding hills. Sheep can be available for training experienced trial sheep dogs by prior arrangement. This is a working hill sheep farm. BBQ and outside seating supplied. Surround yourself with Tranquility but only 10 minutes from A9 and 4 miles from the beautiful village of Comrie.